In 2014, the top career executives at the Veterans Affairs Department faced a new process to expedite their removal under a measure signed into law by President Obama. Last year, President Trump signed a new law replacing that authority and again creating a separate, faster track for VA to fire Senior Executive Service employees. In between, SESers faced restrictions on their bonuses. Now, a bipartisan pair of senators is taking one more crack at boosting oversight of VA’s highest-ranked civil servants. Sens. 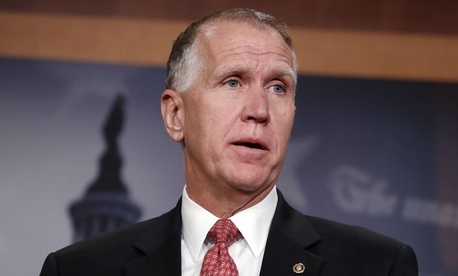 Thom Tillis, R-N.C., and Angus King, I-Maine, introduced earlier this month the VA Senior Executive Accountability Act (S. 2382) to provide additional transparency for SES reassignments. The benefits of the measure would be twofold, the lawmakers said, as it would help eliminate executives who use reassignments for personal gains and prevent the department from moving managers around rather than disciplining them. The senators said they are concerned about the Appraised Value Offer Program, which VA uses to recruit and relocate employees for mission critical positions. The program is run by a private company that contracts with the General Services Administration to help employees who are relocating to find a purchaser for their old home. The company will buy it outright for a fair market price if a third-party buyer is not identified quickly enough. An inspector general report in 2015 found VA’s senior executives were improperly taking advantage of the program and other relocation incentives for their own financial gains. Diana Rubens, senior executive director of the Veterans Benefits Administration's Philadelphia office, was accused of abusing her authority to secure a transfer from Washington, D.C., to her current position, along with nearly $310,000 in relocation costs, including more than $200,000 through AVO. The IG report led to VA suspending the AVO program, but the department reinstated it in November 2016. “Unfortunately, there have been several instances in recent years where VA executives have fallen short of their duties to the vets they were meant to serve,” King said. A Government Accountability Office report released last year said VA has taken steps to tighten its internal controls over its use of the program, but found the department does not adequately track the program’s usage in order to better inform future decision-making on its deployment. The reauthorization of the program was done “quietly” and with no “implementation policy to avoid abuse,” according a report on a companion to the Senate bill in the House, where it has already passed unanimously. The measure would require the VA secretary to approve all SES reassignments “to ensure that such moves are justified and are in the best interest of the department, veterans and taxpayers.” VA would also report to Congress semiannually to update it on all senior executives who were reassigned and the associated costs. In addition to shining a light on potential abuses in spending, lawmakers said the increased scrutiny would inhibit VA leaders from transfering SES employees to different positions rather than taking them through the disciplinary process. A markup for the bill in the Senate Veterans' Affairs Committee was postponed and has not yet been rescheduled.